You probably feel guilty when you skip breakfast. Why wouldn’t you? Many of us grew up with parents fussing to make sure we had something in our bellies before we set off for school. Or we were brainwashed by TV commercial propaganda that promised eating cereal would make us lean and athletic, that breakfast keeps our metabolism on track and helps us avoid bingeing later. It turns out the research on eating breakfast has been far, far less conclusive than either your mother or Tony the Tiger would have you believe. In fact, if you’ve been eating breakfast to stave off weight gain, researchers are increasingly learning that breakfast might have the opposite of the desired effect — it can promote more calorie consumption and weight gain. But even the best available studies in the mix have serious limitations. Before we get into what the science says, it’s worth understanding how the myth of breakfast was created. Much of the research suggesting that breakfast is absolutely crucial for your health is … funded by cereal makers. Check out the disclosures on these papers to get a sense of the conflicts: This review of observational data, which concluded that breakfast skipping is not a good way to manage weight, was funded by the Kellogg Company. Another study, which found that skipping breakfast had health costs, was funded by the Quaker Oats. Quaker also contributed to the study design — and edited the manuscript! Granted, that’s not proof that the study is wrong, but it should make one awfully skeptical. Second, it’s true that there are some independent studies suggesting breakfast has health benefits. But even these are less convincing than they appear at first glance. Researchers have published a number of observational studies that find an association between abstaining from breakfast and having a higher body mass index or higher rates of illnesses like coronary heart disease. (Some are sponsored by industry, some aren’t.) If you glance over those studies, you might assume that skipping breakfast is bad for you, that it somehow screws up your metabolism, brings on diseases, and causes you to gain weight, possibly by eating more later in the day. But it’s important not to confuse correlation with causation. These observational studies generally took people who were already eating breakfast and then compared them with people who weren’t. They weren’t experiments that randomly assigned people to eat breakfast or not and compared the difference. That means breakfast itself may not account for differences in bodyweight or disease between the two groups. People who eat breakfast might differ in other ways from those who don’t. Maybe people who exercise are more likely to eat breakfast, and that explains the difference. Or maybe it’s a function of income. It’s hard to tell. More recently, researchers have published randomized controlled trials that can better pinpoint the effects that eating or skipping breakfast have on weight loss. In these studies, participants are assigned to eating breakfast or skipping, then compared to each other. Since the only difference between the two groups is whether they ate breakfast or not, it’s easier to tell if an early meal caused a difference in health outcomes. The largest such trial to date, published in 2014, followed 300 people who were trying to slim down for 16 weeks. The researchers found that eating breakfast had no effect on weight loss during this period. “Reasonable evidence now suggests that skipping breakfast can actually be a useful strategy to reduce weight,” the author of an editorial about the BMJ study, Tim Spector, wrote. But even this review of the best available evidence isn’t conclusive. One major problem: The trials only ran for a maximum of 16 weeks. (Seven of the 13 ran for fewer than four weeks.) And that just isn’t enough time to assess the long-term health impact of breakfast. “As the quality of the included studies was mostly low, the findings should be interpreted with caution,” the authors warned. Many researchers are also skeptical of the oft-repeated claim that breakfast makes kids smarter. The data here is equivocal, as this 2009 review of the research notes. There was some compelling evidence to suggest undernourished kids perform better at cognitive tests when enrolled in a breakfast program. But it wasn’t clear that the breakfast itself was doing the trick — it might have been the fact that the program led to increased school attendance. Maybe feeding children dinner would have the same effect. So should you eat breakfast? It’s worth being clear about what research on breakfast says and doesn’t say. It suggests the claims that breakfast is a health panacea may be unsupported — and that eating breakfast might not be a great weight loss strategy. So it’s entirely possible that breakfast has amazing health effects, especially for some groups, like growing children and athletes. It’s just that there’s not a lot of good evidence behind those benefits. Some experts, like Yale nutrition specialist David Katz, have made the case for breakfast: He says it’s a good time of day to stock up on fiber and fruit. And for growing kids, breakfast is as good a time as any to eat. 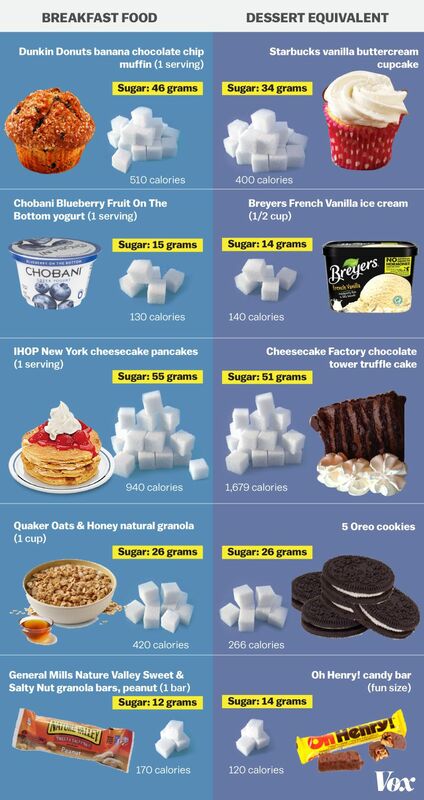 That’s an important point, given that we know breakfast in America (muffins, waffles, sweetened yogurt) is often little more than repackaged, sugary dessert. So if you’re going to eat breakfast, seek out foods that give you the vitamins and nutrients you need to stay healthy, like fruits, vegetables, fiber-rich cereals, and eggs. Steer clear of desserts masquerading as breakfast, like high-sugar granola or yogurt. I find that starting my day with muesli — a mixture of yogurt, fruit, nuts, and oats — sets me up very nicely. But that’s just me. If you’re a breakfast eater, carry on; just make sure to choose healthy foods. If you’re not, don’t fret. The best science we have suggests you’re fine either way.